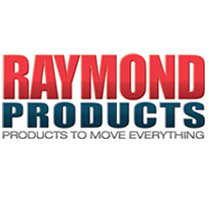 Raymond Products has been manufacturing specialty handling equipment for over 50 years. Raymond Products offers the widest selection of table and chair movers, including chair dollies, chair totes, folded chair trucks, stacked chair totes, hanging folded chair totes and folded chair dollies. A feature that set them apart are their red non-mar, skid resistant vinyl coating which protects the furniture being transported. One of the most popular furniture storage movers requested is a stack chair or folding chair dolly. Raymond chair trucks come in a variety of sizes from their two tier folding chair caddy that can transport and store up to 72 folded chairs, or their half-size hanging chair storage trucks and are excellent for storing chairs in a small space. They have several folding table trucks, or panel movers that can be used to transport folded tables. Their round folding table truck movers feature the unique step assist feature that allows tables to be rolled onto the load area with ease. Raymond combination chair and table trucks have unique designs that offers convenience and flexibility. Their student desk mover is great for moving classroom furniture during routine cleaning, and also be used to move stacked chairs and a variety of compact utility tables. For moving office furniture, Raymond Products have file dollies and office desk movers that make quick work of a heavy job. Raymond Products ship out in 2-3 days and are all made in the USA.